Dr. Knut Pfeiffer, is Christian German doctor specialist in internal medicine. For more info: www.pst-knutpfeiffer.de . He has discovered that Zamam water has far more positive effect on human cells than regular drinking water from Munich, Germany. He also believes that Islamic prayers are more positive effect on the energy and thus health than Christian prayers. Zamzam water comes from a spring in Mecca created by God to save the life of Hajar (Abraham's wife) and her son Ishmael when they were in the desert. I'm sure scientists thoughout the world wil be amazed at what they have missed over the centuries! Don't make fun of this.. why not try it yourself. It will only cost you one apple. I think I will. Insha'Allah I'll post the result here in 2 weeks. What are musics' "physically visible effects". Actually, I was just stating a fact. Seriously, this Dr. Knut Pfeiffer (who is a Christian) says that he believes Islamic prayers are 'a more positive effect on the energy' than Christian prayers. Is he saying that there is a Christian God and also an Islamic God then? This is obviously polytheism. Anyway, why is he a Christian when he believes that Islamic prayer is more effective? By the way, I myself do have some belief in the power of prayer, but I don't believe that it works in the same way that natural laws work - i.e. we just snap a switch and BIngo! you have an instant result! Don't you think that's a good reason for skepticism? One other thing about this apple/ music/Qu'ran reading business. It doesn't actually state what type of music was played to the apple. Is all music the same to apples? To Muslims? This seems to be important as I'm thinking of trying the experiment. Oh, and also no particular verses from the Qur'an are specified. Or are they all the same to apples? And Muslims? Sorry, one more thing. What particular type of apple was used? And what was the relative humidity level and temerature at the time? Light levels? Air pressure (eg height above sea level)? What measures of hygene were observed, if any? Any transients? Don't be negative! Why not try it? Isn't it good to keep an open mind? I used one Italian yellow apple, as I bought lots of them at the time.. I slashed it in 2 equal halfs, wrapped each half in a clear plastic bag. I then put one half in front of a radio that is tuned to a Quran radio station, which we listen to in the house most of the time. I put the other half in another room, far from the first room, with no audio reaching it. No music, nothing. After 22 days, the results are amazing masha'Allah. I just checked it minutes ago. Insha'Allah I'll take photos and post them here. The first apple, near the Quran, had almost no signs of deterioration, the skin was still firm, and the color was still bright yellow. The other half turned completely rotten, with awful green mold, lots of wrankles and the yellow color was replaced with redish spots allover. To tell you the truth, I didn't expect this at all. That is why I invite everyone. Try it yourself. You'll sacrifice one apple and a couple of plastic bags, but the amazement is worth the try. When I think of it, perhaps there is a scientific reason. The Quran tells us that all things worship The Creator. Maybe the bacteria or fungi (don't know what they're called) I mean the little creatures that usually attack an apple and cause it to rot, maybe they were overwhelmed by the words of the Quran. Maybe it made them too busy worshiping Allah subhanahu watalla. I don't know.. this definitely worth scientific lab-level experimentation. 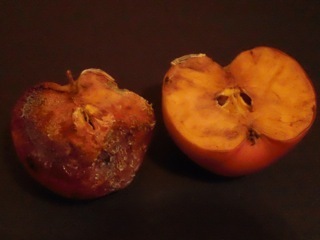 Apple's 2 halves, after 22 days in plastic bags. The right-side half was placed near a Quran recitation from a radio station. The left-side half was placed where there was no audio around. Has this been tried with other music, like metal or hip hop ? Could be sound wave related. If you're referring to my experiment, there was no music involved. No ultrasonics here. The Quran recitation came from a portable radio cassette (like the one below) that has a small speaker, and the volume is kept low at all times. and what sura was it, is it some special sura???? I am going to try this my self inshallah... Thanks dot for the results.. I had the radio tuned to a Quran station, most of the nights, so I'd say 5 hours or more during the night, plus more during the day hours. No specific surah.. the station airs the whole Quran. It takes them 3 days to complete a Quran recitation, then repeat with a different reciter.. and so on.